Where does Donald Trump stand on the issues of drug use policies, legalization, the War on Drugs, and provision of addiction treatment? Check out some of his quotes in this infographic. 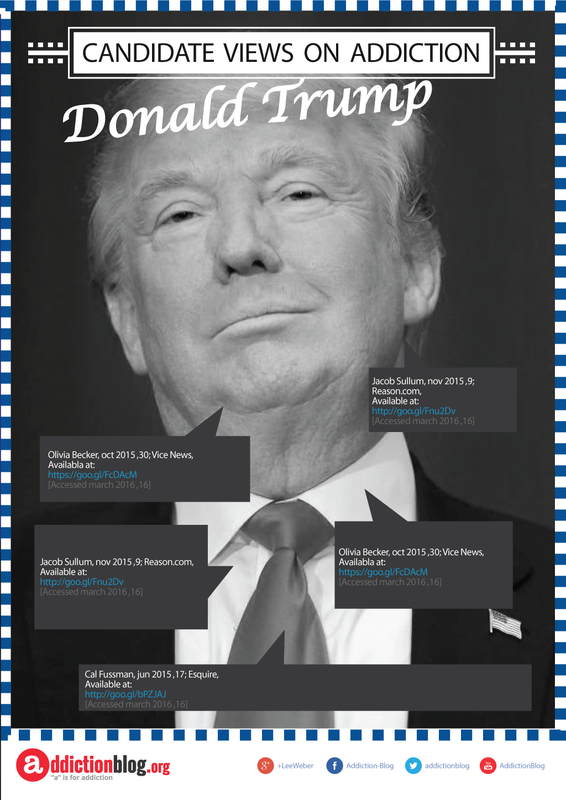 Donald Trump, a republican party candidate for the 2016 Presidential elections is no stranger to controversy. So, where does he stand on the issues of drug use policies, legalization, the War on Drugs, and provision of addiction treatment? We can safely put him at the moderate end, although his stand in the past used to be more radical than you can imagine. 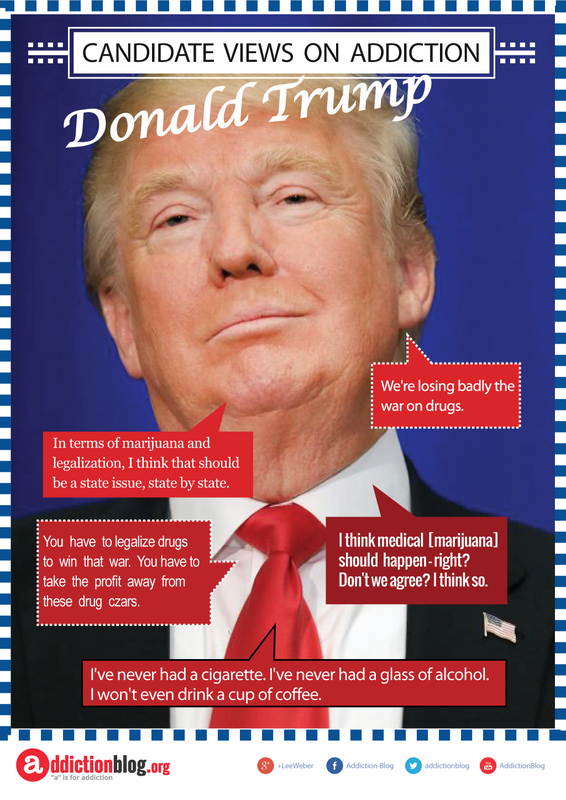 In this infographic we present some of Donald Trump’s drug-related quotes that give you a better picture of his views. Do you agree or not? Let us know by posting your comments and questions in the section at the end of the page and we’ll try to respond personally to all legitimate inquiries as soon as possible. ….referring to Colorado and Oregon’s experiment with marijuana legalization. We hope you like our infographic series on drugs, alcohol, and addiction treatment quotes by the 2016 presidential candidates, so feel free to SHARE. For any further questions and comments you have, please share them below. We try to get back with you personally and promptly. Reference Sources: 1. We’re losing badly the war on drugs. 2. I think medical should happen, right? Don’t we agree? I think so. 3. I’ve never had a cigarette. I’ve never had a glass of alcohol. I won’t even drink a cup of coffee. 4. You have to legalize drugs to win that war. You have to take the profit away from these drug czars. 5. I think medical marijuana, 100%. 6. In terms of marijuana and legalization, I think that should be a state issue, state by state. 7. They’ve got a lot of problems going on right now in Colorado [where marijuana is legal], some big problems. I do not believe someone with an addiction to crack, cocaine, meth or heroin should go to prison for their addiction. They need medical care and treatment not prison.and I think treatment will help better than prison. Hello! I would like to know what is the current position of president Trump on War on Drugs? Is he going to follow past actions and invest in prevention or will he direct his efforts in interdiction in the growing countries? I do not believe someone with an addiction to crack, cocaine, meth or heroin should go to prison for their addiction. They need medical care and treatment not prison.